Vanamal Lucifer loves Wade Walker! As a wee child I saw Cry-Baby in theaters and I absolutely loved it. I continued being completely obessed with the movie and the character of Wade Walker until I was 17 and saw Pink Flamingos at a midnight showing, hosted by our local late night movie "Horror Hosts" Nightmare Theatre. Soon after that I put the connection between my favorite childhood film, and my new "out into the world adult" favorite film. Estatic at the connection, I researched as much as I could about John Waters and all the actors and characters in his movies. At this point, I like the movies he made in the 70's-80's most; aside from Cry-Baby which still remains my ultimate guilty pleasure. For John Water's 60th birthday, I got my first tattoo; my subtle tribute to John. 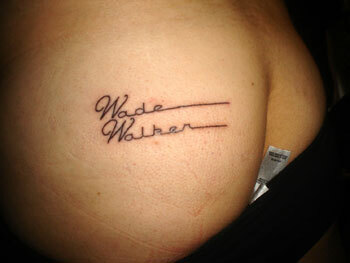 The text "Wade Walker" on my left buttcheek. In 2006 I was in Atlanta where I met the lovely Traci Lords. I greeted her as Wanda Woodward and she blushed and said in an excited manner than no one at the con had yet to mention that movie. I live my life working in a locally owned health food co-op and going part time to a slacker community college. The rest of the time I'm alive you can find me either tending my garden or masturbating while watching underground flicks in my room. I love to shop for all kinds of things af the fleamarket and all of my clothes were either found in a dumpster, very cheaply thrifted, or stolen from highclass botiques.